MMQB: Are Big Manufacturers Killing Innovation? Unable to contain the rapid rise in Humanscale’s success at home in the US and internationally the “Big Three” of contract furniture manufacturing have embarked on free market capitalism tactics that make the Russian oligarchs of the new look Russia look rather amateurish. In this past week’s Monday Morning Quarterback (a leading contract furniture publication in the US) an article was published producing proof of the manner in which large furniture manufacturers are denying the US consumer the right to choose products that are leading innovation in the world today. For Steelcase, Knoll and Herman Miller the documented negative sales growth since 2007 seems to be too much to bare. 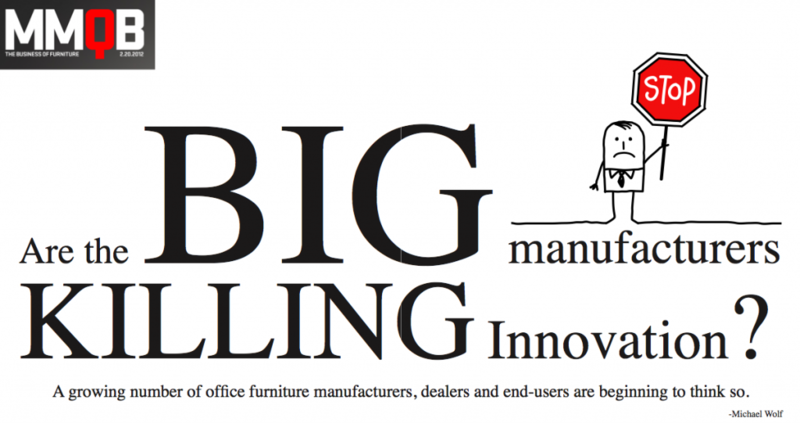 Design innovation at Humanscale has seen averaged double digit sales growth since the same period and the trend promises to continue with a number of exciting new ergonomic tools ready for launch on 2012. As a consumer, ask yourself the following question; who would you rather spend your valuable pennies on when considering solutions to increase the productivity of your office? The established “Old Timer” using strong-arm tactics to deny you access to true innovation – or the little guy that continues to develop international award winning products based on high performance and simplicity. Imagine what the “Old Timer” would achieve had he spent as much energy developing his own innovations as he did trying to hide his competitions new ones?